A phasor is a complex number in polar form that you can apply to circuit analysis. When you plot the amplitude and phase shift of a sinusoid in a complex plane, you form a phase vector, or phasor. As you might remember from algebra class, a complex number consists of a real part and an imaginary part. For circuit analysis, think of the real part as tying in with resistors that get rid of energy as heat and the imaginary part as relating to stored energy, like the kind found in inductors and capacitors. You can also think of a phasor as a rotating vector. 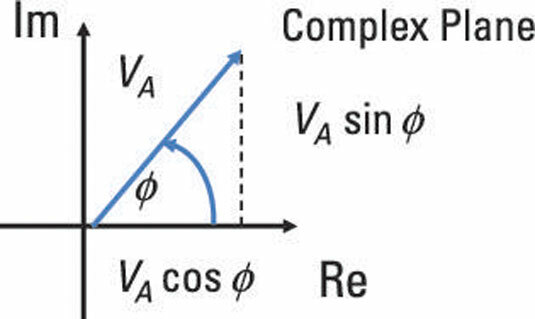 Unlike a vector having magnitude and direction, a phasor has magnitude VA and angular displacement ϕ. You measure angular displacement in the counterclockwise direction from the positive x-axis. Here is a diagram of a voltage phasor as a rotating vector at some frequency, with its tail at the origin. If you need to add or subtract phasors, you can convert the vector into its x-component (VA cos ϕ) and its y-component (VA sin ϕ) with some trigonometry. The following sections explain how to find the different forms of phasors and introduce you to the properties of phasors. Phasors, which you describe with complex numbers, embody the amplitude and phase of a sinusoidal voltage or current. The phase is the angular shift of the sinusoid, which corresponds to a time shift t0. So if you have cos[ω(t – t0)], then ωt0 = ϕO, where ϕO is the angular phase shift. In the equations shown here, Re[ ] denotes the real part of a complex number, and Im[ ] denotes the imaginary part of a complex number. 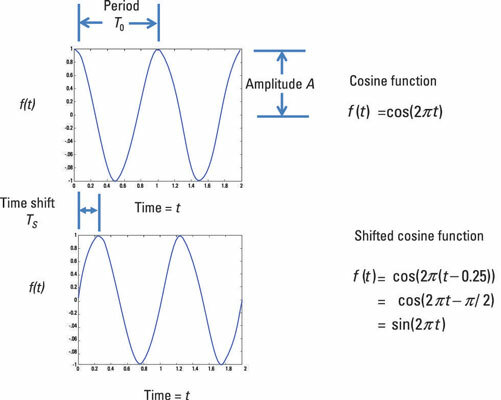 Here is a cosine function and a shifted cosine function with a phase shift of π/2. For this equation to work, phasors V1, V2, …,VN must have the same frequency. You find this property useful when using Kirchhoff’s laws. When taking the derivative, you multiply the amplitude VA by ω and shift the phase angle by 90o, or equivalently, you multiply the original sine wave by jω. See how the imaginary number j rotates a phasor by 90o? Working with capacitors and inductors involves derivatives because things change over time. For capacitors, how quickly a capacitor voltage changes directs the capacitor current. For inductors, how quickly an inductor current changes controls the inductor voltage.